I was recently working with a client reviewing their database structure and funnel management process. In the analysis, I saw they regularly send emails to more than 100,000 people, which represented more than 95% of their database. They were sending the same message, at the same time, in the same way to everybody in their database. This approach is a highly ineffective (and dangerous). The solution was to create a clear process for segmenting their database. In this case, we identify 7 key categories (and each category had multiple sub-categories) to build their segmentation strategy. This approach enables them to quickly create a virtually unlimited number of cohorts to deliver, customize and contextualize both the messages and the actions they take. Now imagine the added impact when you take this approach to all facets of your lead management program. I think this is the most difficult concept for demand focused executives to grasp. Lead generation and selling are not the synonyms (this is part of the reason why organizations that create focused prospecting teams see better results). If you think of revenue generation like a complex manufacturing process, “selling” represents the finishing portion while lead generation is the initiation. When you’re selling, remember that you must cross two thresholds: the first is the “why should I talk to you” threshold and the second is the “why should I buy from you” threshold. 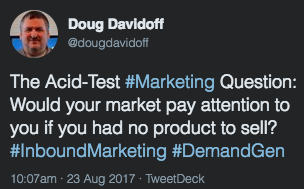 Yesterday I shared the acid-test question any marketer should ask when assessing their approach: would your market pay attention to you if you had no product to sell? This is also the acid-test question for lead generation strategies and tactics. For lead generation to work - really work - it must create value for the prospect. Actions and communications must be valuable whether or not a purchase occurs if you want them to create value. If you want to create more demand, increase your growth rate and lower your costs of growth. Stop selling so much. 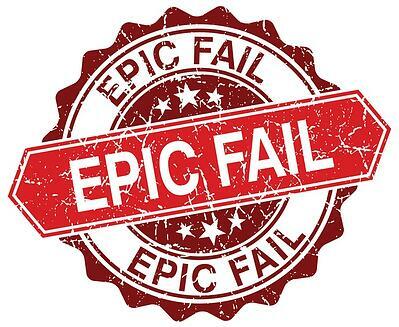 I call this issue the reason that strong lead generation programs fail. The ugly truth is that the vast, vast, vast majority of sales processes are not designed to work with strong lead generation. If you don’t know what I mean, just go to a website for someone who is selling something. Make a request for contact, fill out a form or schedule a demo, then watch what happens. Blah, blah, blah, about me, about me, about me, we do this, we do that, we do this other stuff, tell me how it would help you to benefit from my product/service? I recently had an interaction with a company who sells a product specifically designed to support professional, insight driven sales processes. The first call started off nicely. The rep had been on my website and knew something about what I did. He began by asking me some reasonably good questions to gain an understanding of where I was coming from, what mattered to me, what I knew and, by extension, what I don’t know. I smiled as the process began and I thought that finally, I’d see a process tailored to my situation. I probably don’t have to tell you what happened next. He immediately went into demo/presentation mode and it was exactly what he presents to every person he ever talks to. It would have been better if he had just sent me a video that I could have watched on my time. It was their lead generation efforts that sparked my interest and intrigue - the salesperson did nothing to stimulate that interest. I’m a qualified, sales ready prospect for them. That doesn’t mean I’m a “write the check” prospect for them. The problem is that their sales process was clearly not designed to move me forward and enable me to understand the impact of their product. It was only designed to educate me on their product. Frankly, if that’s all they need to do to meet their sales objectives they should get rid of 90% of their salespeople, put all of their presentations on video and let me navigate my own journey with some help from someone if I need it. Frankly, if they had taken that approach, they would have had a better chance of winning my business. It’s also important to reiterate that their process (given the strong start) is probably in the top 20% of those I’ve experience over the last five years. The best prospects are open to being influenced. They’re looking to learn more. Great lead generation gets you the opportunity to connect with prospects earlier in their journey. If your sales process isn’t designed with this in mind, then your salespeople will hate the leads that marketing creates, and marketing will get frustrated by your sales team’s inability to successfully manage the leads they’ve worked so incredibly hard to create. It’s a myth that buyers don’t want to talk to salespeople. What’s true is that buyers don’t want their time wasted by salespeople. If you address these three core areas, you’ll find your lead generation efforts will align with your buyers more naturally and you’ll see the sales growth that rises from such alignment.